There’s no doubt that visitors love a good giveaway at tradeshows. Let’s face it, you can only go so far with branded pens. Over the years, our exhibition team has come up with a huge range of alternative giveaways to help our clients to stand out from the crowd. From tasty food and drink, to handy phone chargers and even care packages full of thoughtful gifts for busy visitors (think blister plasters and power snacks!). However, in the pharma industry, there are strict regulations on what companies can and cannot giveaway. So a smarter approach is needed. At the same time, the ultimate aim of the exhibition stand is to raise brand awareness and attract new customers. And to do that, passing on knowledge remains the most important giveaway. Even in our online world, most pharmaceutical tradeshows continue to produce a plethora of printed materials and takeaways. And it's hard to ignore the fact that most of it is dumped after the excitement of the event is over. Stuff simply gets lost or left in hotel rooms. And when you consider the cost of copy, design and full-colour printing, this can be a painful pill to swallow. But you don’t have to give your delegates a printed pack. Instead, rather than providing delegates with something throwaway on the day, consider going paperless. Say goodbye to printed leaflets and sheets and hello instant e-data downloads. Today people are bombarded with a plethora of sales messages – straight into their inboxes – every single day. And it’s just as easy for delegates to bin an email copy of your company brochure as it is a hard copy. So you have to think smarter to really add worth to your content. To boost engagement with your brand, use online tools to tell people about what you will be doing at the exhibition (e.g. any seminars or demonstrations) and provide details about the itinerary. You should also look to integrate tablets, dynamic displays, screens and even virtual or augmented reality into your exhibition stand to disseminate information. RFID (radio-frequency identification) technology can also be used to guide visitors around a pharma exhibition stand, creating an interactive and informative journey that enhances their overall experience. And consider offering free whitepapers or ebooks that can add value to your visitors’ businesses (while subtly letting them know how you can help). Today, edata provision can be a fantastic conversation starter at your pharma exhibition stand. And to encourage people to read it before the excitement of the event is over and it’s back to business as usual, consider including incentives that can be realised during the show. As well as helping to keep your delegates informed and engaged, e-data provision will also boost your green credentials. Furthermore, providing edata to visitors usually involves an exchange of information between you and them. And, after this data is collected, it can be used to enhance your business intelligence functions, leading to more complete customer profiles, better insights and analysis, and more detailed sales reporting. So, data is not just about providing visitors with the info they seek, but also a great way to follow up with people after shows. But, it is essential that any data you collect in return for providing information (e.g. email addresses) meets the relevant industry and local legal regulations. For example, in response to the rapid growth of technology, the GDPR has significantly modified the way we can collect, store and use personal data. And, ensuring compliance could be a minefield for even the most seasoned of event professionals. Today, permission-based interactive marketing is the goal. So your exhibition stand needs to get people interested in your brand, and make sure they remember it later. To do this, you need to get smarter about your marketing methods and offer a solution your customers are going to respond to. Ultimately, a paperless pharma exhibition stand should help to draw visitors to you, allow you to start conversations, enable the compliant sharing of data, and create a lasting memory. All while helping you to save the environment. 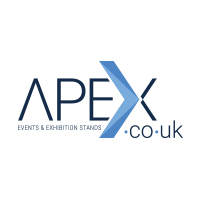 At Apex, as well as creating eye-catching pharma exhibition stands, we also keep you compliant, remove the stress, boost footfall and make your tradeshows a success. To find out more give us a call on + 44 (0)1625 429370 to discuss your requirements in more depth.